Deadman Wonderland was first introduced to the majority of its Western audience thanks to an anime adaptation that began airing in English back in 2012. However this was only a sample of the story and one that readers who have already looked picked up the first volume of the Deadman Wonderland will know is missing numerous characters. Now after the events of the last volume, how will the story of Deadman Wonderland continue in volume 2? As with any review of a following volume, it is worth noting that there will be spoilers for the first volume to follow. Anyways, to recap a bit Ganta Igarashi has been sentenced to death and placed in the bizarre prison named Deadman Wonderland for the crime of murdering all of his classmates. However he has been framed by this crime by the ‘Red Man,’ a being capable of mass destruction and after the events of the first volume we learn that Ganta was given a special power called a ‘Branch of Sin’ after his run in with this mysterious enemy. After coming face to face with the Red Man once more and displaying his power, Ganta awakens in the hospital after passing out and suffering from anemia. With Shiro by his side, he is temporarily able to rest, but this does not last for long as the head of the prison’s security Makina saw Ganta use his powers and unleashes a powerful robot named Necro Macro to either retrieve him or kill him. Before Ganta must run for his life, he hears rumors about Cell Block G where the Red Man is supposed to be housed and as such that is his goal. In part because of the uncaring machine chasing them down, Ganta, Shiro, and Yo manage to come across a large door labeled G. Once the machine catches up to them the true nature of Deadman Wonderland as well as a few hints Ganta’s abilities are revealed. With the nature of Deadman Wonderland revealed and Ganta now placed in Block G, he must face off against other “Deadmen” like himself who are capable of using their blood as weapons in duels where the prize for the victor is a large amount of prison currency and a lifesaving piece of candy but the price of losing is extremely high. Now while the first volume revealed how sinister life in Deadman Wonderland is by setting the tone and detailing the rules of the prison, this second volume takes advantage of that build up and begins to move at a very fast pace. Very little time is spent sitting around as each chapter follows Ganta and the rest as they are either running for their lives or in later chapters Ganta battling against a fellow Branch of Sin user. There are some new details about the prison revealed in every chapter when things slow down as we learn the name the prison has given to the Red Man as well as some details concerning the power structure in the prison, with a decrepit Governor having complete control but letting the Warden Tamaki do as he wishes by orchestrating matches between Deadmen and continuing his research of their conditions and simply murdering people for his own amusement. By the end of Deadman Wonderland Volume 2 a whole new layer of story has been revealed to readers and a major cliffhanger and more questions are raised in the last few pages of this action heavy volume. As for the whole ‘missed content’ of the anime, there are a number of characters, including new Deadmen, introduced and additional plot elements added into the manga to make it somewhat familiar to those who may have seen the anime but definitely worth picking up for the definitive story. Kazuma Kondou’s art throughout this volume is very impressive despite the limitations that a series set in a prison provides. The character designs for the new characters introduced in this volume are impressive looking and memorable and all of the returning characters are nicely drawn as well. The standout examples of the artwork in this volume are Shiro’s expressions as well as how impressive the Branch of Sin battles appear on the pages. It is worth noting however that although some pieces see quite a lot of detail and there are a few two page spreads featuring impressive artwork, a large number of panels feature either completely white or black backgrounds which is an unfortunate limitation of the setting. Also this is not a series for those who are afraid of gore as there are a few pages with detailed drawings of evisceration and torture. A quick mention also goes for Viz’s translation of this volume, which for the most part is superb and doesn’t damage the art in any way, but does feature an odd sounding translation of Senji’s Branch of Sin being called “Crow Crow” which could be a misprint or simply a strange translation. With this release of Deadman Wonderland Volume 2 readers are greeted with a color page right off the bat involving Ganta having a nightmare which is then followed by a two page color spread showing Shiro, Ganta, Makina, Yo, and Tamaki behind bars. Outside of this the end of the volume features two pages showing off the blueprints of the Necro Macro in a comedic fashion which is then followed by four one page comedy shorts that help lighten the tone a bit. 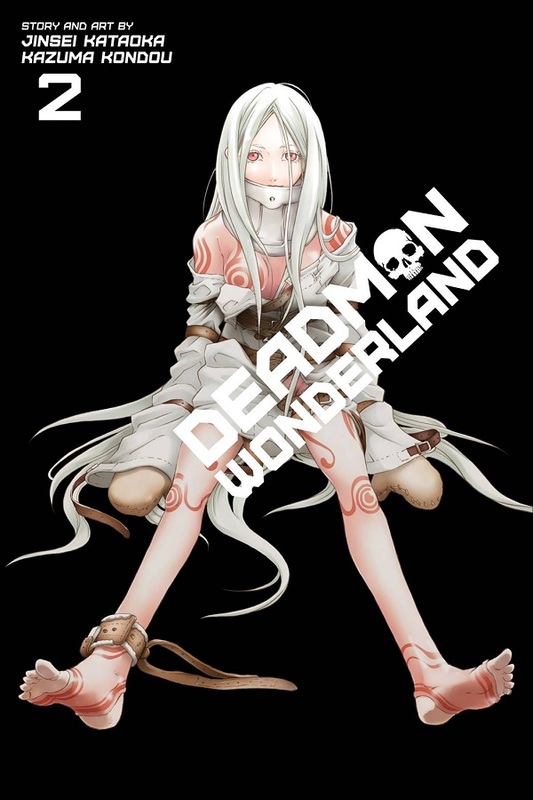 Deadman Wonderland Volume 2 takes advantage of the world building from the first volume and dives headfirst into the numerous secrets that lay within the depths of the prison. However with every question that is answered two more appear in its place and to top that off, the amount of action spikes heavily in this release making volume 2 quite a page turner as readers will not want to put it down until they see what happens next. With a final scene only raising more questions and a large number of new characters just introduced, it will be interesting to see where the story will go from here.